McCall #1014 makes an "Upside-down" doll (what we would now call a topsy-turvy doll) or two different single dolls. The dolls with legs will measure 15" tall. 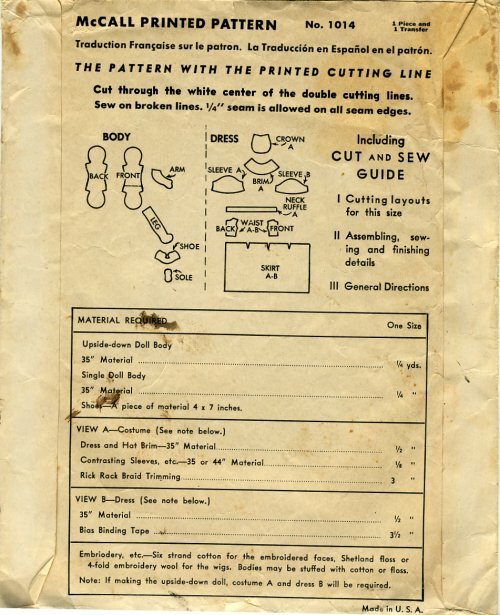 This pattern has a copyright date of 1942. The single dolls have identical body construction, with different embroidered faces and different hairstyles. One face has a serene expression, while the other has a surprised look. The maker is instructed to use "Shetland floss...embroidery wool or four fold Germantown" for the hair. There are darts in the back of the head to shape it. They have mitten hands and no soles on their feet. Each doll wears a dress with short puffed sleeves, but trimmed differently. There is no underwear pattern for the single dolls. The dresses are made to be removable, even on the upside-down doll. One doll wears a hat, the other has a bow in her hair. 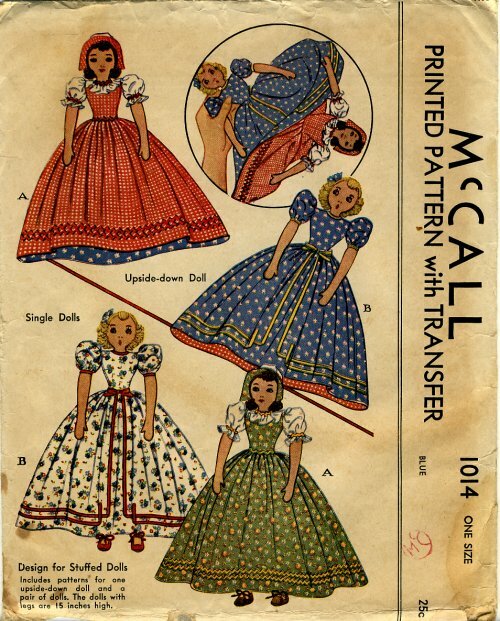 Dolls made from this pattern are not as commonly found as some of the other topsy-turvys. Black/white dolls, storybook dolls like Red Riding Hood/wolf/Grandma and awake/asleep dolls seem to have been more popular than blonde/brunette.